The winners of the inaugural Dairymaster Agricultural Science awards at Waterford Institute of Technology have been announced as John Molloy, Ballingarry, Co Tipperary and Aine Butler, the Commons, Co Tipperary. The award is to recognise the achievements of BSc (Hons) in Agricultural Science degree students with the best final year project presentation, and was judged by a panel of experts from Dairymaster, Teagasc and WIT. Earlier this year the leading dairy equipment manufacturer, Dairymaster, whose aim is to help drive excellence in future generations in the agricultural industry, was announced as award sponsor. “The Dairymaster Agricultural Science Student Award process will help students realise the relevance of their final year projects to a world beyond college. The bursary is very welcome in helping our students make the transition to the workplace following their studies,” said Dr Michael Breen, course leader. Aine chose the topic 'selenium deficiency in dairy cows' for her thesis. Aine went to St Brigid's College in Callan Co. Kilkenny and chose Agricultural Science because she has always loved farming at home and thinks the future is bright for farming and for agribusiness. John Molloy recalls that he chose to study at WIT following a conversation with course leader Dr Michael Breen at WIT’s Open Day. John was very interested by the fact that the course offered the opportunity of work placement in year three which he completed in Teagasc Moorepark Animal & Grassland Research Centre, Co Cork. His final year thesis in WIT was based on his interest from research which he got from Moorepark. His thesis looked at “The effects of body condition score and energy balance on the milk fatty acid profile of lactating dairy cows”. “The aim of the study was to investigate the effect of body condition score change of the lactating dairy cow and how this influences milk fatty acids found in milk. The purpose was to be able use milk samples in the future as indicator of high body condition score loss or negative energy balance in lactating dairy cows. This information can be used by farmers to make tactical decisions such as increasing concentrates or reduce to once a day milking,” he explains. There are approx. 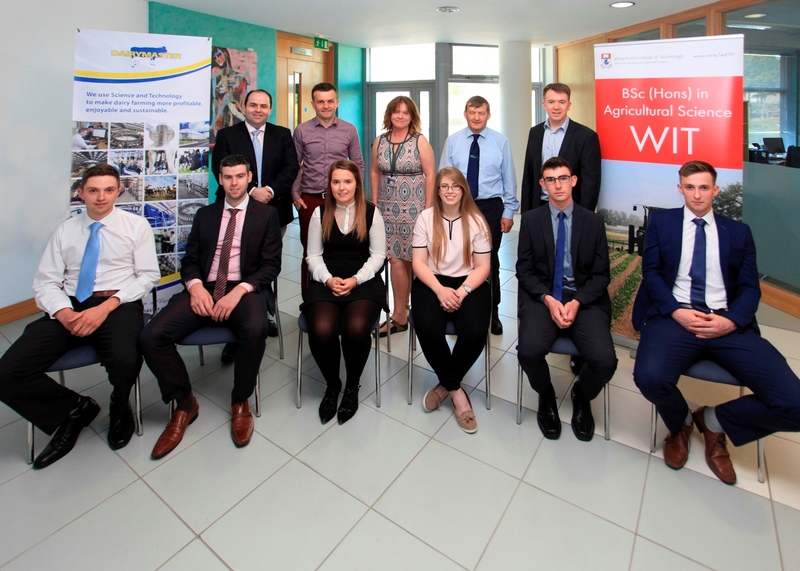 180 students across all four years of the Agricultural Science programme, with students travelling from beyond key catchment counties of Waterford, Wexford, Kilkenny and Tipperary from all parts of Ireland to study Agricultural Science at WIT. Dairymaster has won numerous Innovation Awards worldwide including at the three largest agricultural exhibitions in the world. Dairymaster have customers in more than 40 countries, including Britain, France, Germany, Iran, Japan, New Zealand, Russia and the USA.